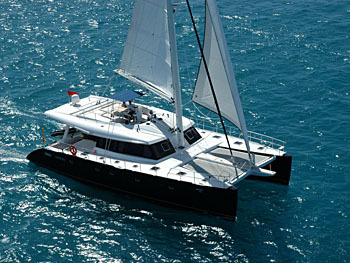 Catamaran LUNA was launched in 2006 by the well renowned Sunreef Shipyard and refitted in 2012. 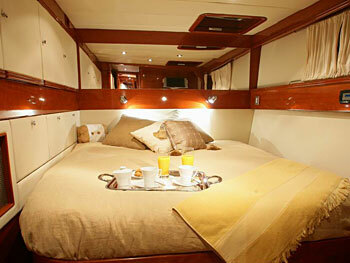 Measuring 18.9m (62ft), the luxury catamaran LUNA can accommodate up to 8 guests, in 4 double, en-suite cabins. 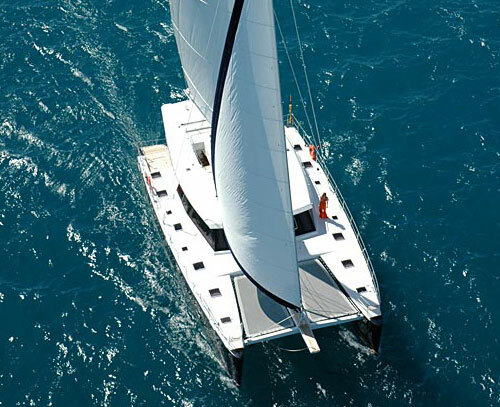 The Sunreef 62 catamaran LUNA boasts a warm modern interior of the finest of cherry wood finishes, supple leather furnishings and a neutral, yet exceptionally elegant décor. The salon is an open plan, integrating the lounge and formal dining, creating an inviting space, ideal for entertaining or relaxing. A large L shaped sofa has a convertible coffee table, effortlessly becoming an elegant formal dining area. 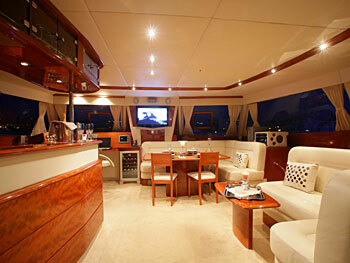 A further seating area boasts a small cocktail table and sits opposing the full service galley and built in wet bar. 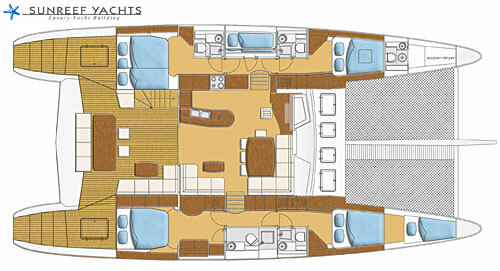 Thanks to surrounding windows and wide aft sliding doors, the Sunreef 62 boasts plenty of natural light and an open airy atmosphere. 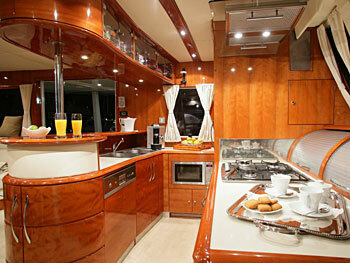 Exterior space is ample aboard the luxury sailing yacht LUNA. 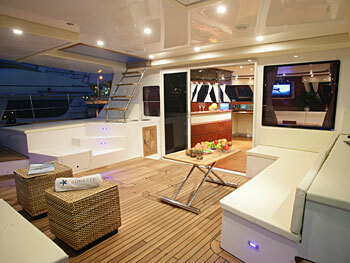 The main deck features a generous partially shaded aft deck, seating and alfresco dining option. 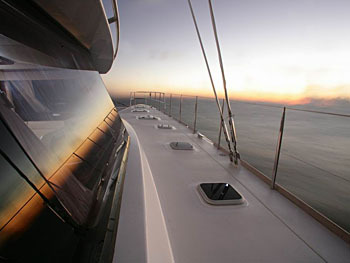 Two large sugar scoop transoms are ideal for water activities and boarding from the tender. 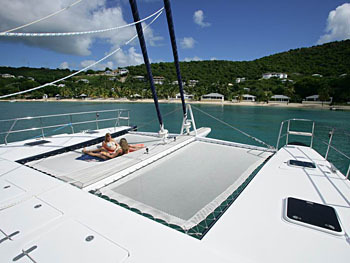 Forward, 2 massive trampolines will entice anyone looking to soak up the sun, or simply relax whilst under sail. 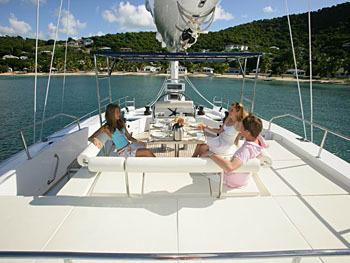 A flybridge is well-appointed and offers a further alfresco dining option and sunpads. 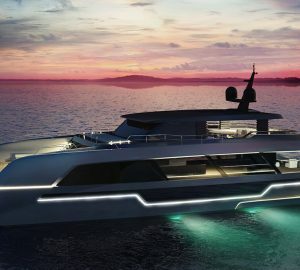 The LUNA catamaran is a Semi-owner version. One Master cabin and bathroom with separate shower, one large double cabin with additional pullman bed and bathroom and two double cabins with personal bathrooms. Fishing gear, snorkeling, wakeboard, tender Zodiac jet.